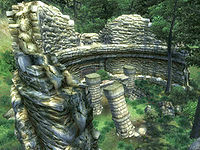 Fort Carmala is a small fort between Chorrol and Skingrad containing vampires (quest-related). It contains only one zone, Fort Carmala. 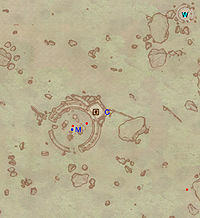 This location's map marker (M on map) is named Fort Carmala (editor name FortCarmalaMapMarker). The entrance door is NE of the marker, 60 feet away. 1 Chest is on the northern Pillar, next to a Zombie carcass. When you first enter the fort, there is a small room containing a bedroll (b) and the corpse of a treasure hunter (E), which contains light armor, a weapon, and various unenchanted loot. There is a vampire in the next room. Continuing down this hall leads to a gate which opens to a small room containing rats, but no loot. 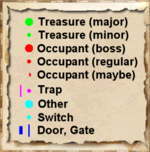 Going to the left leads to a room with two coffins, containing miscellaneous unenchanted loot. Going to the right leads to an Old Wooden Door, behind which is the Vampire Patriarch/Matriarch (A), the only boss-level creature in the fort. There is a passage connecting the left and right sides of the fort, but it contains little more than a handful of nuisance animals and a couple of vampires. From where you enter the final room, you should have an opportunity to consider your plan of attack before the boss becomes aware of you. Once they are defeated, you can find two lesser soul gems on the base of the left statue, a boss-level coffin and a wooden chest containing two bottles of Shadowbanish Wine. This page was last modified on 25 March 2018, at 02:51.